For each paying adult, one child 4-9 years old participates in the same program FREE! Promotion is not valid with any other promotion. Promotion is valid only in our new dolphin center in San Jose and is not valid with any other promotion. Choose Your Location! 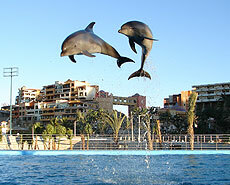 Two word-class Cabo Dolphins facilities are available in Los Cabos. The Cabo San Lucas facility is conveniently located at the marina. The new San José del Cabo location is situated in the Hotel Zone. Both offer excellent amenities and state-of-the-art facilities for the dolphins. If you've ever dreamed of swimming with dolphins, here's your chance to turn your dreams into reality! Cabo Dolphins offers people of all ages the rare opportunity to swim and play with beautiful Pacific Bottlenose dolphins while visiting Cabo San Lucas, Mexico. Cabo Dolphins is one of the most exclusive and beautiful dolphin centers in the world, featuring state-of-the-art facilities, and a friendly family of Pacific Bottlenose dolphins. Our Swim with Dolphin programs are educational and interactive experiences designed to give you a deeper understanding of these amazing animals. Our dolphin swim programs begin with an educational presentation in knee-deep water on a submerged platform in our specially designed educational pool. This introduction will give you an overview of Pacific Bottlenose dolphin physiology and environment. 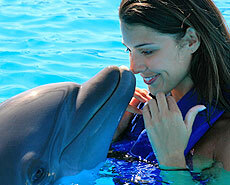 You will then become acquainted with your dolphin through physical touch, hugs and kisses. The dolphins enjoy themselves tremendously and demonstrate their endearing ability to get along well with humans, a trait which never ceases to attract and amaze us. Dolphins are as curious about us as we are about them. You'll have time to swim and play with your dolphin, while experiencing the thrill of up-close and personal contact with this fascinating marine mammal. Our programs are truly unique and exciting, providing you with a thrilling memory to cherish for the rest of your life! In order to give you the maximum opportunity to interact with these lovable creatures, group sizes are kept to a minimum on all of our dolphin swim sessions. 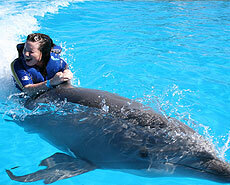 Smaller children (ages 4-9) get to learn about, interact and play with the dolphins in this fun, informative program. The 30-minute program includes supervised introductions to the dolphins and 20 minutes of touching and interacting with these marvelous mammals. Small group sizes ensure memorable fun for all. This is a unique 20-minute fun educational program conducted by the dolphin trainers and provides an informative overview of dolphin anatomy, physiology, natural history and communication abilities. This is followed by supervised experiences in the dolphin pool with the gentle animals, rubbing and petting their smooth skin to understand their physical characteristics on a shallow platform. 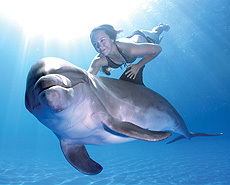 Dolphin training techniques are also explored. An unforgettable experience! Cabo San Lucas - 10am, 12pm, 2pm and 4pm. Paying participating parents may hold children aged 1 to 3 free of charge (this must be noted at time of reservation - 1 paying adult per child). This tour is 50 full minutes of education and interaction with these playful, curious creatures, including 40 full minutes in the water with the dolphin. The dolphin offers it's sleek graceful body to be stroked and gently petted, providing warm and wonderful interaction with their human guests. Photos and Video: Photos start at $15 each for all activities and a 15-minute DVD of your dolphin encounter is available for $45. If you've ever dreamt of swimming with dolphins, the Swim Experience is a great opportunity to get in the water with these adorable and intelligent creatures. The program begins with an educational orientation, including hand signals used by the trainers to communicate with the dolphins. Then you'll wade into the pool to get to know your new friends. Finally, take a ride across the pool with one of the dolphins as you ride on their belly or holding on to their dorsal fin—unforgettable! You’ll experience first-hand (and first fin!) the detailed, meticulous practices used behind the scenes to ensure that these beloved animals receive the highest quality of care and coaching, ensuring that the public can witness the full expression of their boundless enthusiasm and connection to other living things. 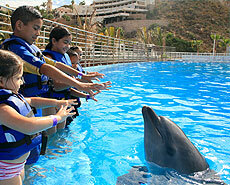 You’ll also be exposed to the deep level of professionalism native to all programs at Cabo Dolphins. Minimum age: 5 years old. Children 5-11 years old must be accompanied by a paying adult (16 or older). *Transportation available from select locations; ask your Cabo Specialist for more information.